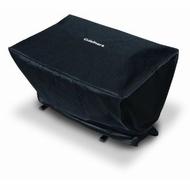 The Cuisinart All Foods Gas Grill Cover is custom fit to the Cuisinart All Foods Gas Grill. Rugged and waterproof, this 600 denier nylon grill cover will stand up to the elements for years to come. Simple, quick velcro straps fix the cover securely to the grill. The embroidered Cuisinart logo looks sharp and won't peel off or fade.